I added some late 80s cards to my album with this TTM success from Jerry Reed. The above 1989 Topps turned out really well. 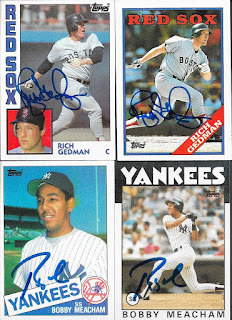 I also got signed cards from 1986, 1987 and 1990 Topps. The '87is for my set, of course. Reed (b. 1955) played in the majors from 1981 to 1983 and 1985 to 1990 for the Phillies, Indians, Mariners and Red Sox. He had a record of 20-19 with 248 strike outs and a 3.94 ERA. 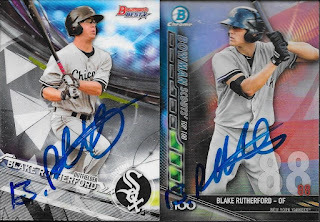 I mailed to Reed on March 19 and got the cards back on March 30, for an 11-day TAT. 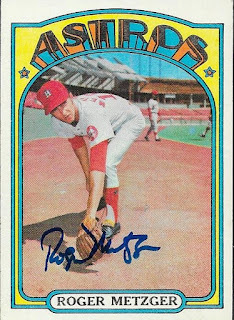 I should be seeing a wave of early 70s cards come in TTM soon. 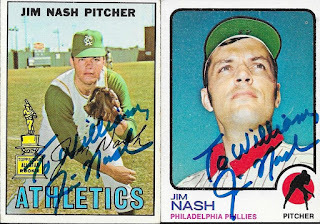 This success from Jim Nash was just a precursor to the ones I have pending. I wanted to add some more eary 70s stuff to my binder, so I bought a bunch of bulk from my LCS, and I also bought a couple boxes from Conrad. 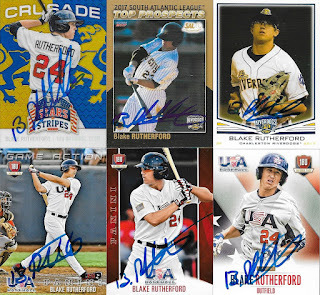 I got some nice cards back from Nash, and he personalized each one. A lot of folks don't like the personalizations, but I don't mind them. I'm not selling anything, so they will go right in my album. Nash (b. 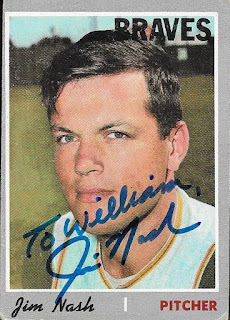 1945) played in the majors from 1966 to 1972 for the A's (KC and Oakland), Braves and Phillies. He had a career record of 68-64 with 771 strike outs and a 3.58 ERA. He finished second in the 1966 AL Rookie of the Year Award voting (behind Tommy Agee) after going 12-1 with a 2.06 ERA. I mailed to Nash on March 10 and got the cards back on March 30, for a 20-day TAT. 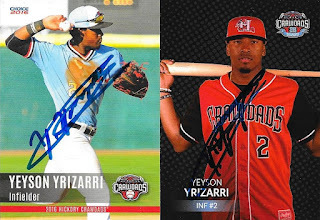 After my almost month-long break from Wood Ducks games, I hit Grainger Stadium hard the last week by weeing three different teams, and getting a ton of cards signed. During the three-game series against the Winston-Salem Dash between May 18 and 20, I was able to get quite a lot done. Chris and I caught all three games, even though the Saturday game was rained out. It was pushed to Sunday, where we were able to see a double header. 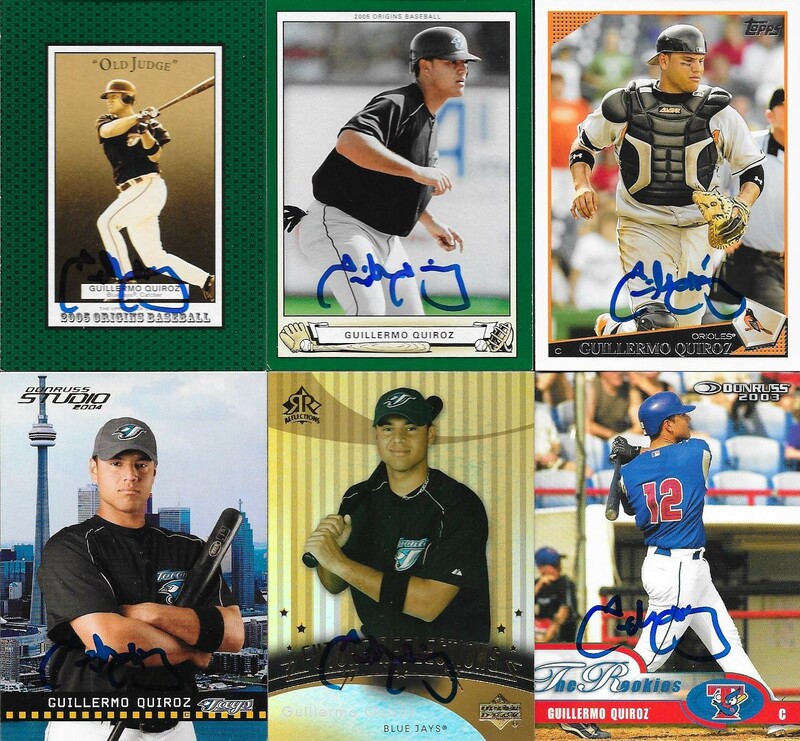 I finished up a bunch of 50/50s, and am almost done with what I had gotten pre-season for the Wood Ducks. 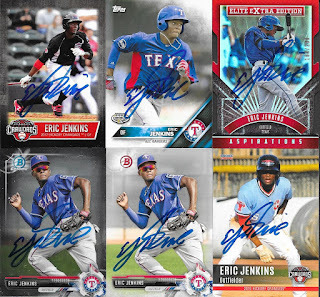 I also am already just about done with new addition, Eric Jenkins. I didn't have many of his cards as it is, but I got all of my stuff and most of the 50/50s done. 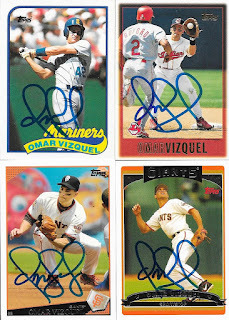 I missed Guillermo Quiroz during the last series with the Dash, but I was able to get all of the cards I had for him completed. 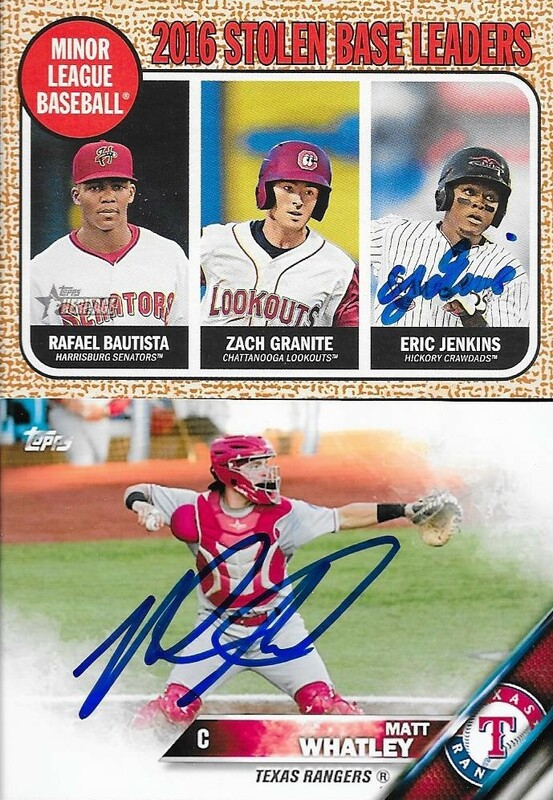 I got Chris's Luis Basabe from the 2017 Carolina League Top Prospects set done. I also was able to get Zach Thompson, whom I missed last time. 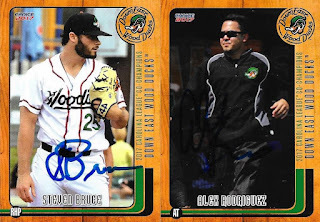 These two horizontal cards turned out really nicely, especially since I kept missing this 2015 All-Star Basabe. 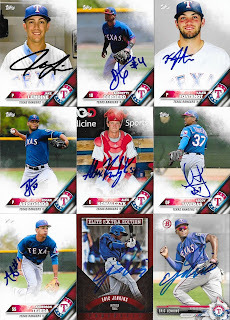 I added a few more Dylan Cease. He dominated the Wood Ducks on Friday night. I doubt he will be in the Carolina League much longer. 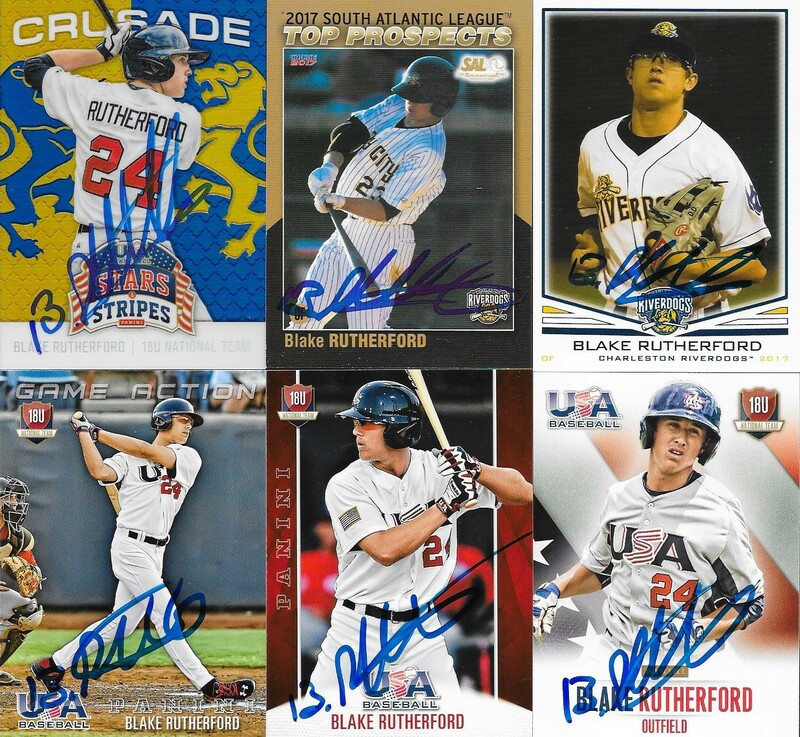 I had picked up a whole bunch of Blake Rutherford's cards in the offseason, and was able to get a few of them done, along with a bunch of 50/50s. These two Rutherfords are probably the ones I like the most. I was able to finish off these two Yeyson Yrizarri cards that I had from Hickory sets. 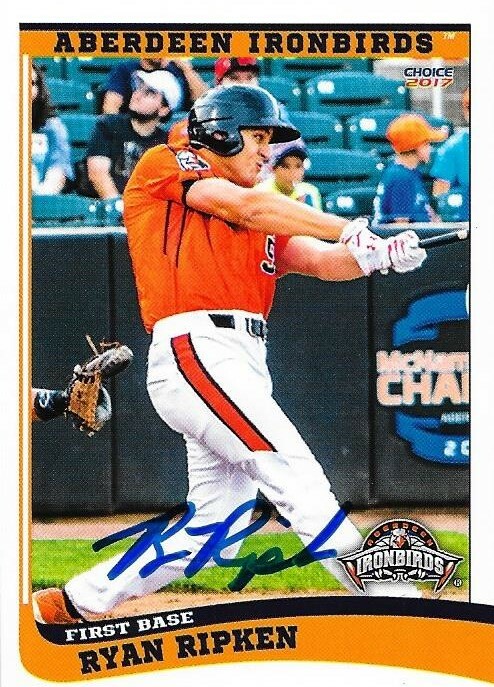 He was once a Wood Duck, but was traded to the White Sox last season. 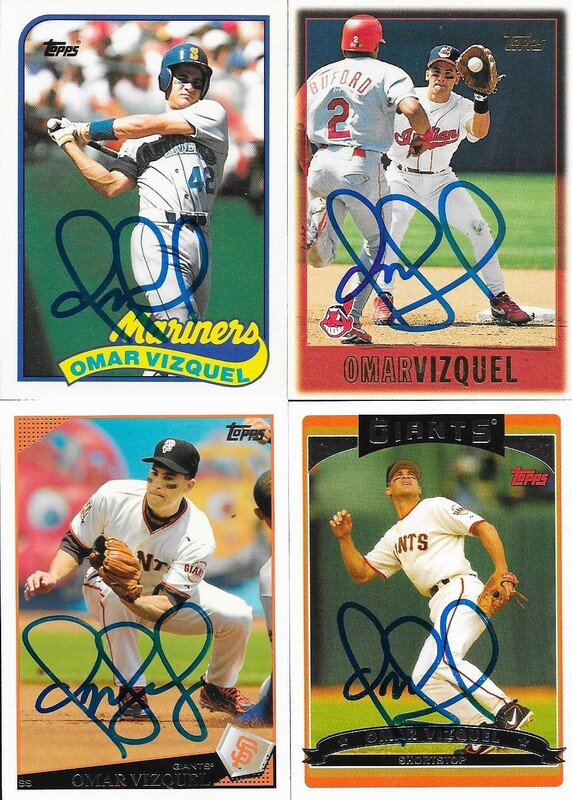 I was really glad to add some Omar Vizquels to the collection. 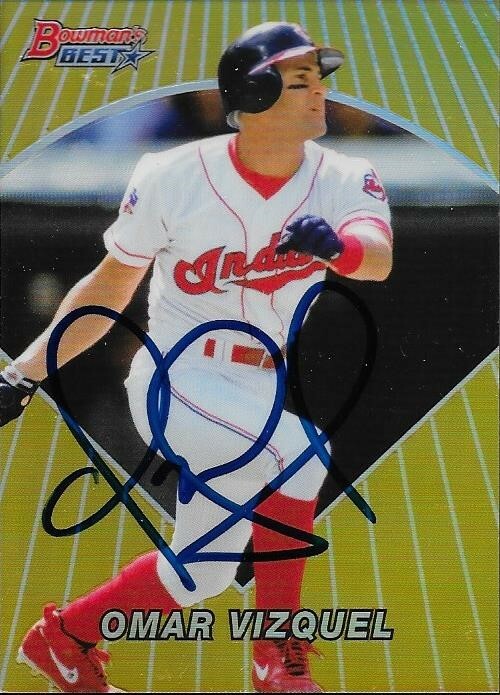 I got his 89 Topps Traded RC signed, along with some other Topps issued, 1997, 2006 and 2009. This 2006 Allen & Ginter Vizquel really came out nice. I got a bunch of mine done, so next time I see him, I will be getting a few 50/50s taken care of. 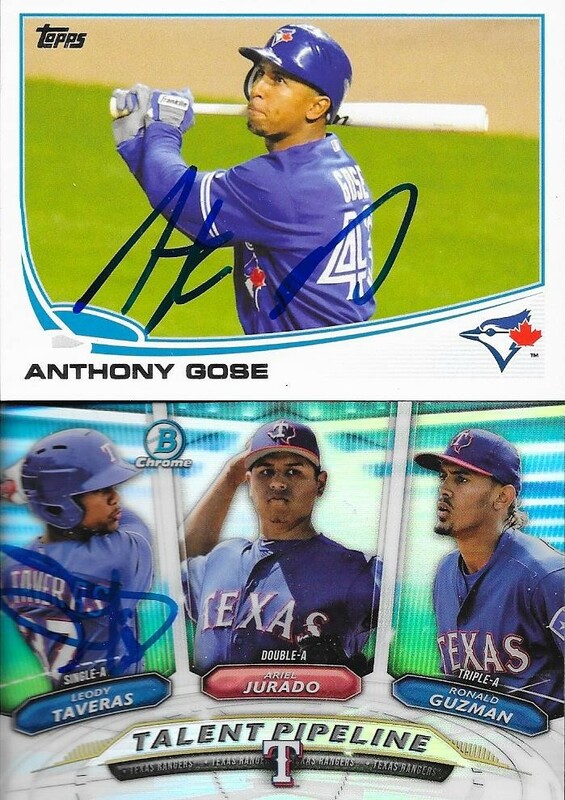 These last two are of Anthony Gose and a 2018 Bowman Talent Pipeline Rangers card with Taveras. My friend, Ethan, said he would finish the card for me. I hope he can. 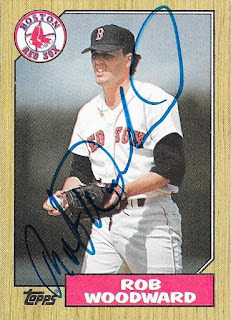 I knocked off another 1987 Topps for my set when I took part in a private signing on SCN. 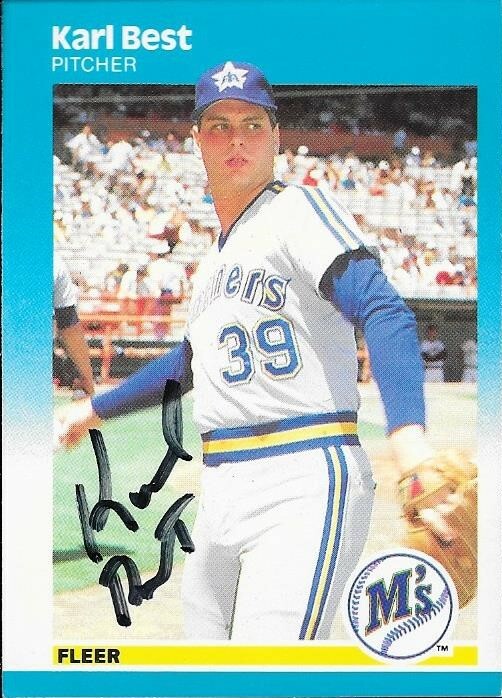 I heard that Rob Woodward was a tough auto to get, so I made sure to get this card out. It turned out really nice, and is now off of my checklist for the 87 set. Woodward (b. 1962) played in the majors from 1985 to 1988 for the Red Sox. He had a career record of 4-4 with 45 strike outs and an ERA of 5.04. I mailed to the private signing on March 19 and got the card back on March 29, for a 10-day TAT. The private signing fee was $10/card. I added another card to my 1987 Topps set with this success from Karl Best. In addition to the 87 Topps, I also got this 1987 Fleer done. He used an old Sharpie on it, and it would have looked better in blue, but I can't really complain. I also added a 1986 Topps and the 1987 Topps checklist, so I could get one of those out of the way. Best (b. 1969) played in the majors from 1983 to 1986 and 1989 for the Mariners and Twins. He had a 5-6 record with 73 strike outs and a 4.04 ERA. I mailed to Best on January 22 and got the cards back on March 26, for a 63-day TAT. 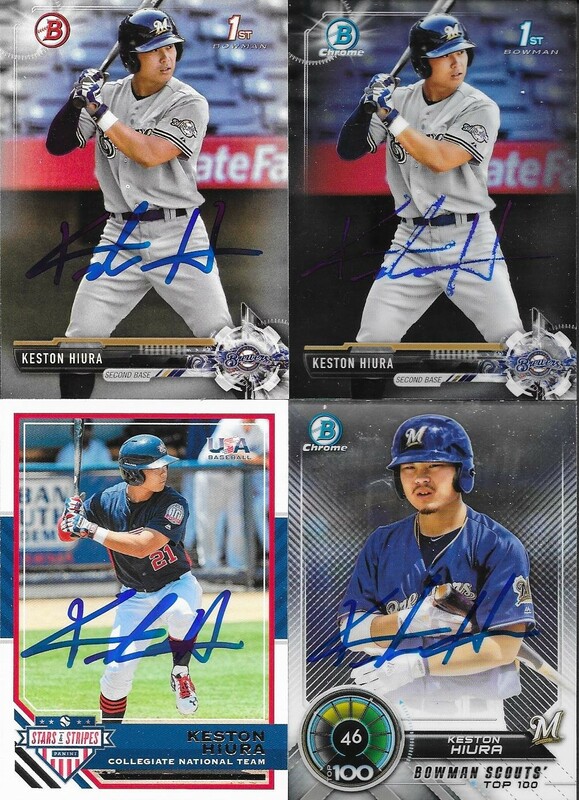 My good friend Gerard hooked me up with some 50/50s and some additional autos in a package recently. This Aneury Tavarez was a gift from Gerard. 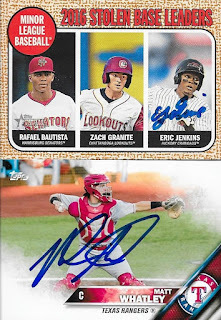 It is a PawSox Dunkin Donuts card that will look cool in my album. 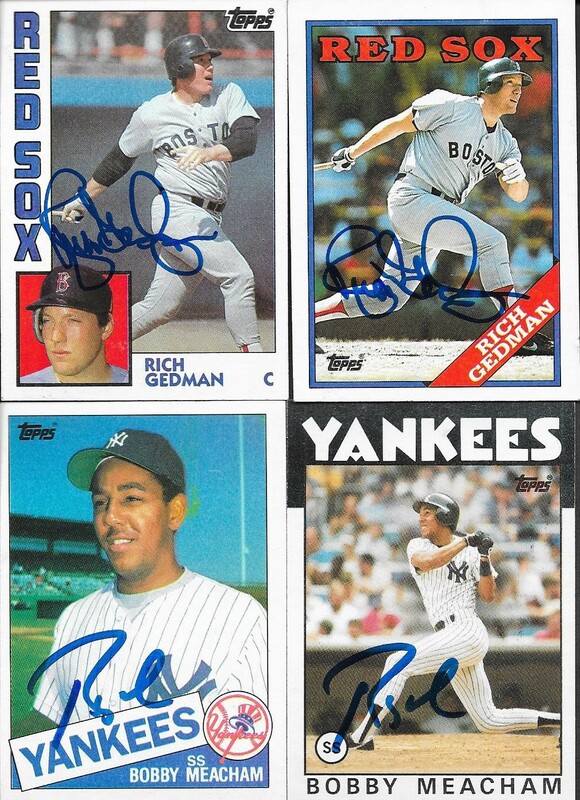 Gerard took 50/50 on Rich Gedman and Bobby Meacham recently, and sent these Topps cards back to me. I had the Meachams, but since Gerard got these for me, they went into my album anyway. 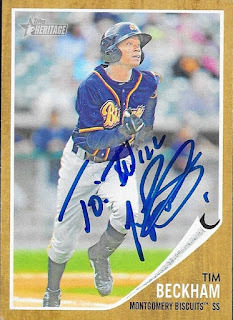 Finally, this 2011 Topps Heritage Minors Tim Beckham looks really cool. 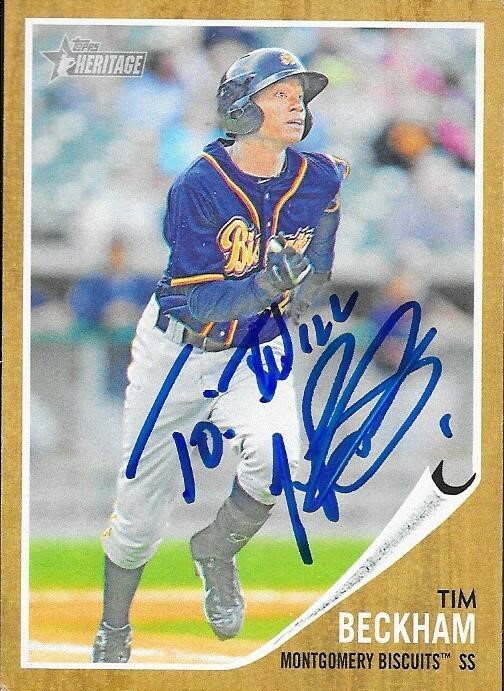 I like the Biscuits, so having this signed card of Beckham in a Biscuits jersey is pretty cool. Thanks for the autos, Gerard. I really appreciate it. 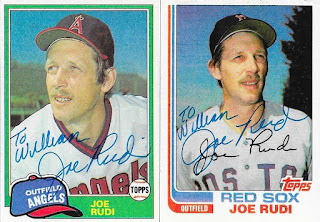 I sat on my Joe Rudi cards for some reason, but finally mailed them out, and got some nice returns. The above 2001 Topps American Pie is a bit different for my album. I'm all for adding different sets and subsets to the album, so this is pretty cool. I also added some more contemporary cards, with these Topps issues from 1981 and 1982. He inscribed "To William" on each card, which was a nice touch. Rudi (b. 1946) played in the majors from 1967 to 1982 for the A's (KC and Oakland), Angels and Red Sox. 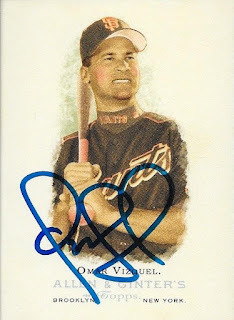 He had 1,468 hits, 179 home runs and a .264 batting average. He was a 3-time All Star (1972, 1974 and 1975) and 3-time Gold Glove Award Winner (1974, 197 and 1976). His best finish in the AL MVP voting was 2nd, wich he did twice (1972 and 1974). 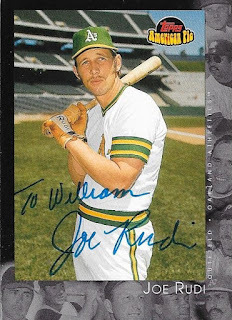 He won the World Series 3 times (1972, 1973 and 1974) with the A's. Rudi appeared on the 1988 Hall of Fame ballot, but did not receive any votes. 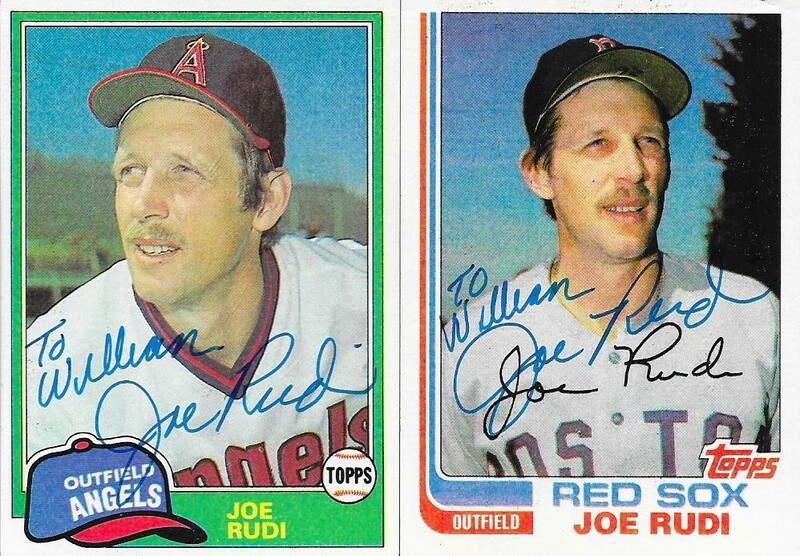 I mailed to Rudi on February 5 and got the cards back on March 26, for a 49-day TAT. I had missed about a month of Wood Ducks baseball games due to many reasons: I got sick, my brother got married, I went out of town to visit another brother, and Chris had a bunch of little league games. I finally got back to Kinston last week and saw the Carolina Mudcats take on the Down East Wood Ducks. 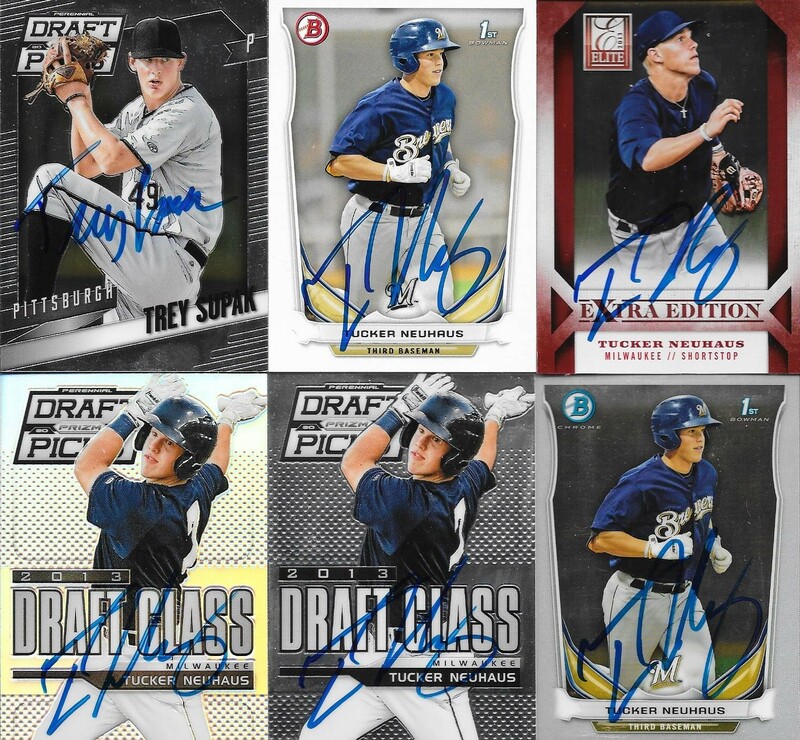 I was really excited because I had the opportunity to get a bunch of cards out of my Bowman box for some of the Brewers prospects that I would see. 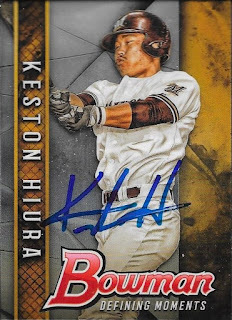 I had a ton of Keston Hiura cards tha I hoped to get signed, and he didn't disappoint. He ended up signing 16 cards for Chris and I, as we were able to get him pre and post-game. Even with all of the Hiura cards that I had, I was still able to get some 50/50s done for my friend, Gerard. I also was able to add some brand new 2018 Bowman stuff to the stack. I got some 50/50s done on Marcos Diplan, but also some cards for myself. 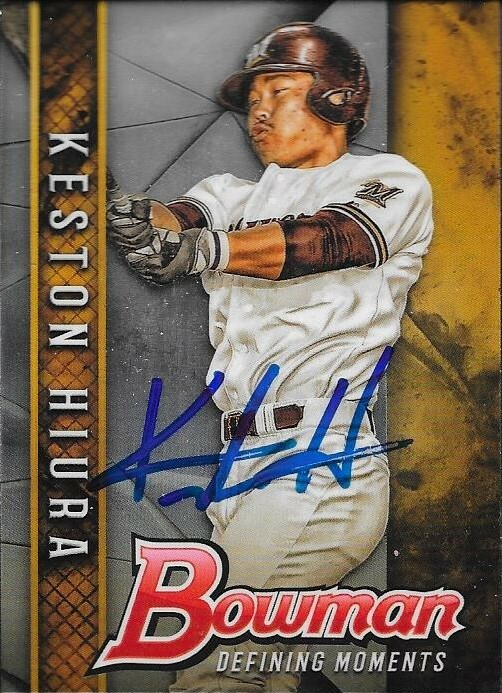 I had gotten him last year toward the end of the season, but it was nice to get some 2017 Bowman Draft done. Tucker Neuhaus was really nice, and signed everything that I had. All of these cards look really great in person. 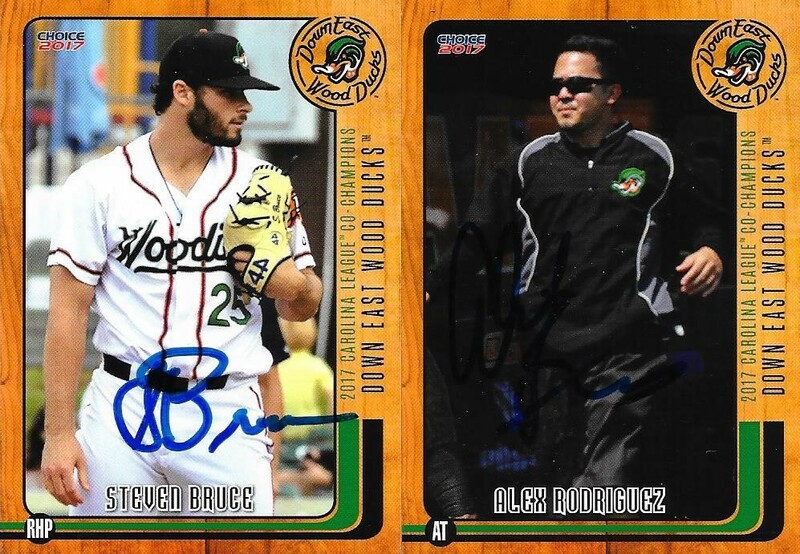 The Wood Ducks called Eric Jenkins up from Single A Hickory to replace the injured Ledarious Clark. 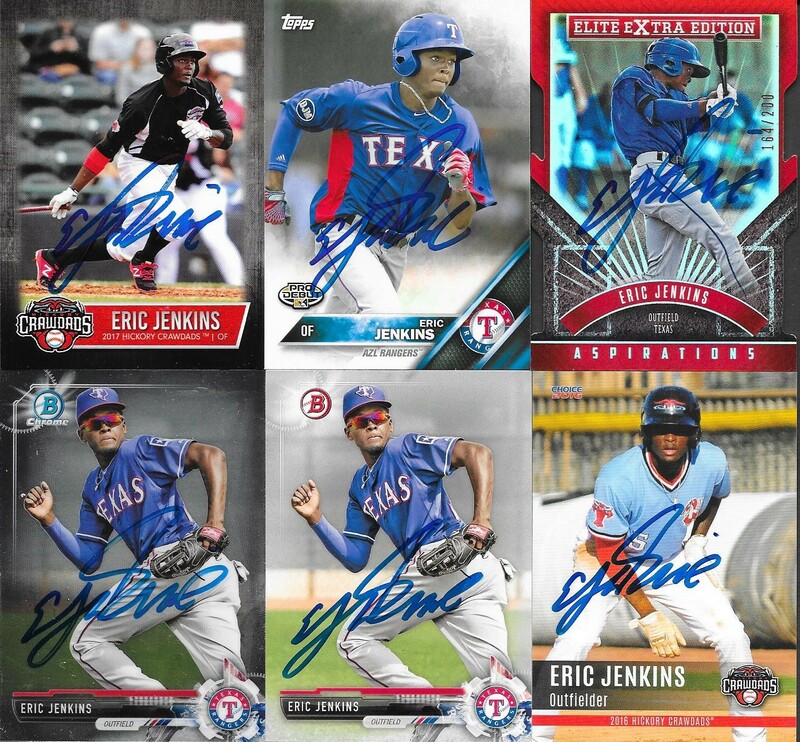 I had a ton of Jenkins's cards that I wanted done, and he knocked them out for me. I also got a bunch of the photo cards Rangersautos sent me for a 50/50. They all turned out great, and I am almost done with his stuff, now. I also just about finished all of the Matt Whatley cards that I had. He was injured at the beginning of the season, so it took a while to get some of this stuff taken care of. I took some more Jake Lemoines out of my box, so those have been whittled down as well. I also added some cool team set cards of Carlos Maldonado that were part of a 50/50. 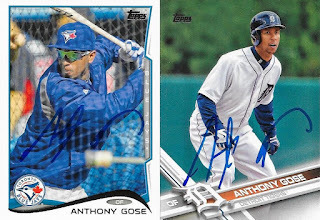 I was surprised to see former Major Leaguer Anthony Gose on the Wood Ducks roster. He signed with the Rangers in the offseason, and they are attempting to convert him to a pitcher. I was able to add a couple Topps cards to my autograph project, which was nice. 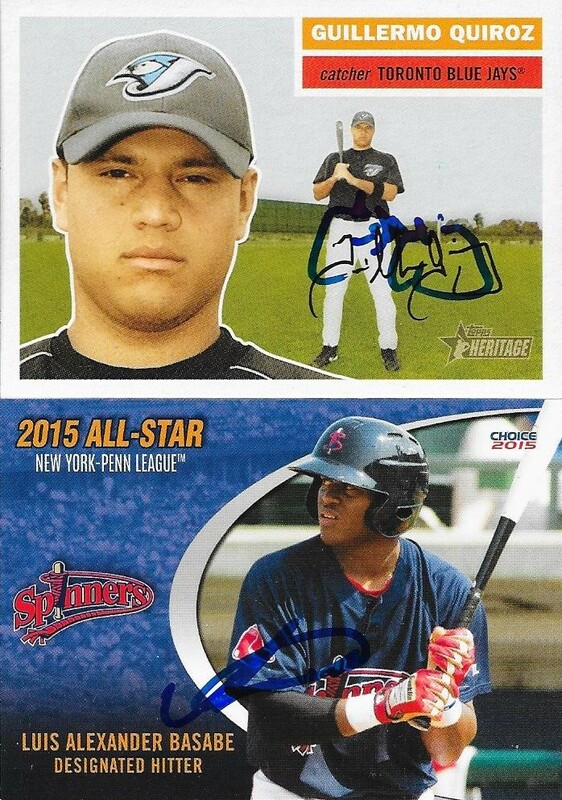 It was especially nice to be able to add a 2014 Topps to my ledger, as I still don't have many of them in the album. So, I'm glad to say that I am back graphing the Wood Ducks. I missed going there, and was able to hit 4 games this past week. There will be another post coming with the Dash series. Stay tuned. 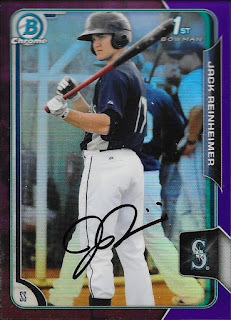 Stepping away from vintage cards for a bit, here is a nice 2015 Bowman Refractor that I got signed TTM by Jack Reinheimer. It turned out a lot better than I thought it would. Reinheimer (b. 1992) played in the majors for 2 games in 2017 with the Diamondbacks. He's currently with the Reno Aces, the AAA affiliate of the Diamondbacks. What I didn't realize was that he was from Charlotte, and he played at ECU. 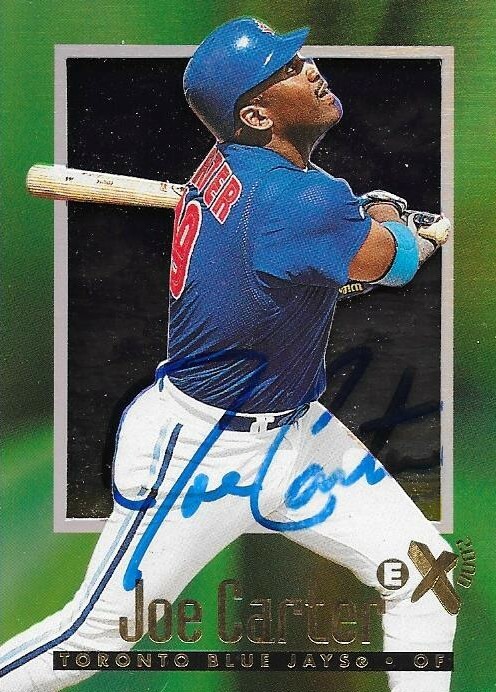 He's only batting .236 so far this season, so hopefully he will heat up and see his way back to the majors, where he hopefully will collect his first hit. I mailed to Reinheimer via Diamondbacks spring training on February 15 and got the card back on March 26, for a 39-day TAT. Another vintage TTM success came about with this return from Roger Metzger. 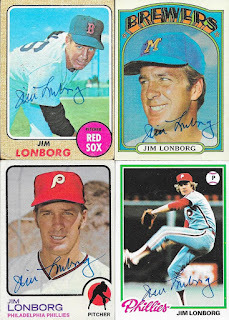 The cards I sent off were 1972, 1978, 1979 and 1980 Topps. The above 1972 looks really cool, with the old stadium shot and some guy photo bombing in the background. Not that I really look at it, all of the cards I sent are empty stadium shots. That is always interesting to me, where they take the shots. Metzger (b. 1947) played in the majors from 1970 to 1980 for the Cubs, Astros and Giants. 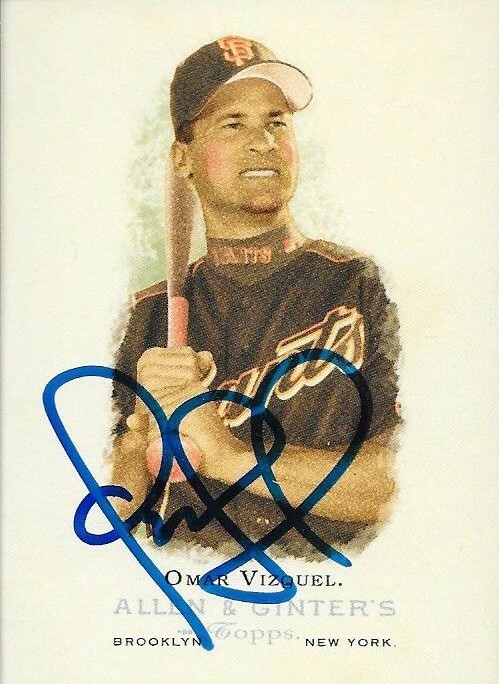 He had 972 hits, 5 home runs and a .231 batting average. He was a Gold Glove Award winner in 1973. For someone with as low a career average as he had, it is interesting that he led the NL in triples twice in his career (1971 - 11 and 1973 - 14). I mailed to Metzger on February 24 and got the cards back on March 26, for a 30-day TAT. 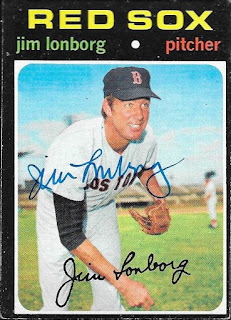 I added some nice late 60s and early 70s cards to my autograph album with this success from Jim Lonborg. I had a lot of cards to choose from, thanks to my LCS, and I'm glad I got them all returned. All of the cards turned out great. Since this TTM success came back, I actually purchased a huge lot of 1972 and 1973 Topps cards from Conrad. I hope to be able to add a bunch more of them to my album. 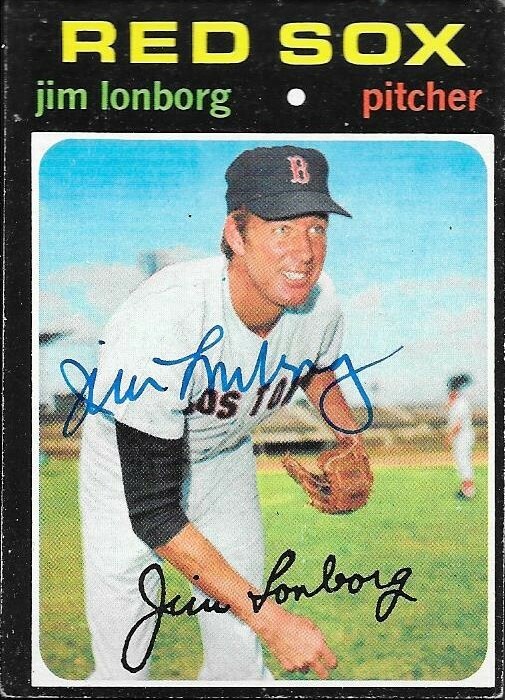 Lonborg (b. 1942) played in the majors from 1965 to 1979 for the Red Sox, Brewers and Phillies. He had a career record of 157-137 with 1,475 strike outs and a 3.86 ERA. 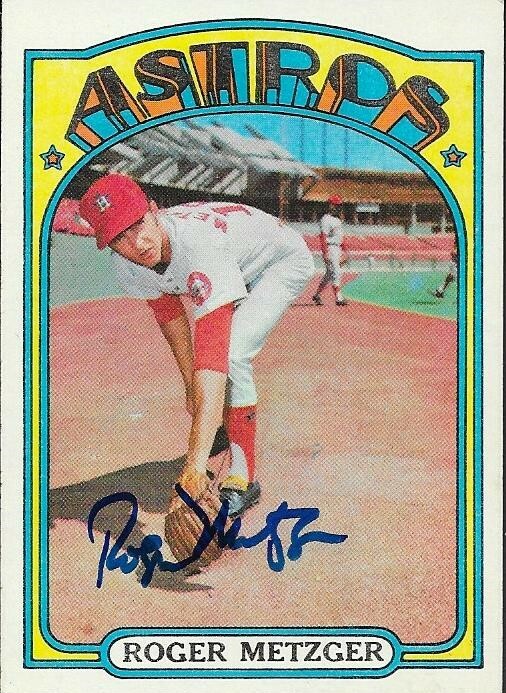 He was the 1967 AL Cy Young Award winner when he went 22-9 with 246 strike outs and a 3.16 ERA. He was also an All Star that season and finished 6th in the AL MVP race. He appeared on two Hall of Fame ballots, 1984 and 1985, but didn't receive more than 0.8% of the vote. I mailed to Lonborg on March 17 and got the cards back on March 26, for a 9-day TAT. 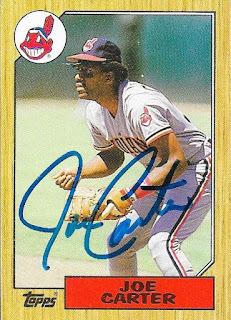 I needed Joe Carter for my 1987 set, so I decided to mail to him again. 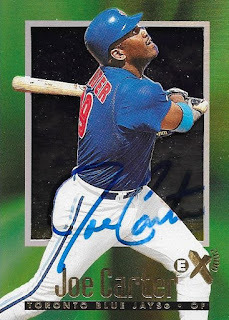 I also included this 1997 Fleer EX, because I thought it would look cool in my album. I was worried that the auto wouldn't turn out too well on it, but I was happy to see that it did work out. I also got the 1987 Topps done, of course. It cost me $5/card, but was well worth it to get these taken care of. I mailed to Carter on March 17 and got the cards back on March 26, for a 9-day TAT. It's fun graphing stadiums for the first time, especially when you have no clue as to where the players come out, and how accessible a stadium is. Luckily, I was still successful last weekend at the Columbia Fireflies game. 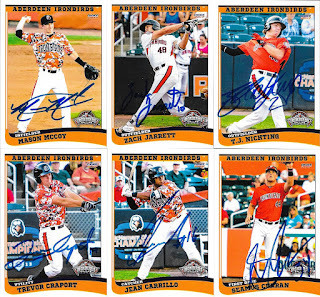 I had a ton of cards for the Shorebirds, since they are the Single A affiliate of the Orioles. I probably took away from some future graphing of the Keys, but since none of these guys are guaranteed of advancing, I went ahead and knocked them out. 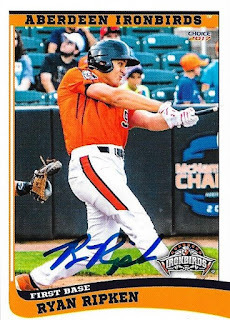 I was most excited about meeting Ryan Ripken, son of Cal. He was really friendly, and chatted with us for a bit. 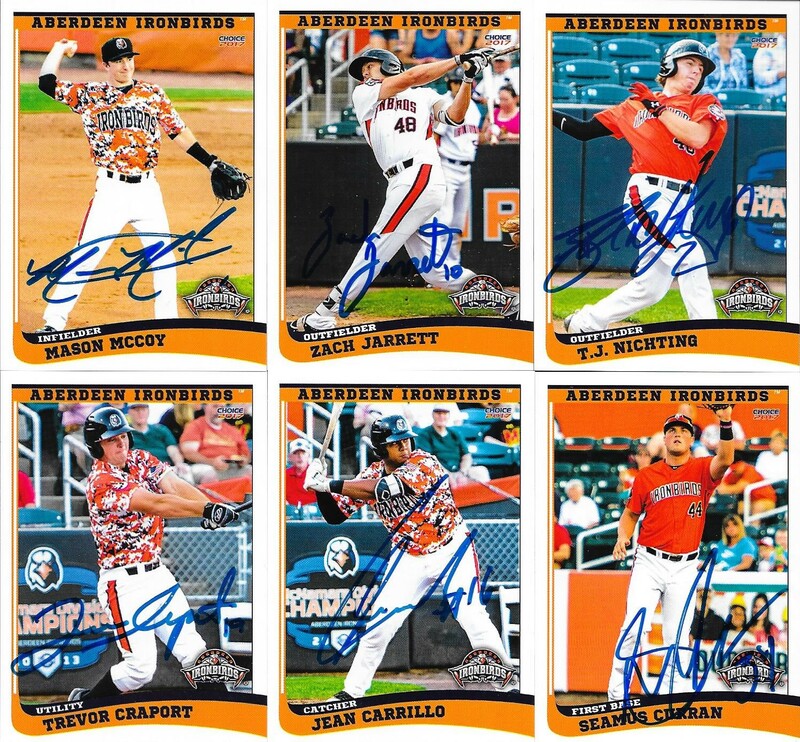 My friend, Michael, picked up an Aberdeen set for me last season, and a few of those guys moved up to Delmarva to start the year. That afforded me an opportunity to get quite a few cards done. One interesting note, Zach Jarrett is a fellow graduate of UNC-Charlotte, which I made sure to point out to him. What I didn't know up until a week before the game was that he is the son of former NASCAR champion, Dale Jarrett. 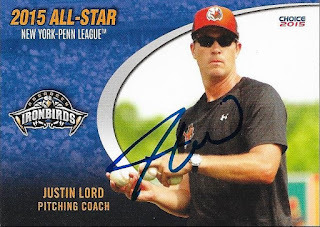 Justin Lord, one of the Shorebirds coaches, was the first auto we got. He was at the wall talking with his family and signed for us after I helped take a photo of his family for him. I was able to get some older Aberdeen set cards done that I had been sitting on for a while. I also was glad to get a few of my 2013 Perfect Game cards signed that I got at the National last year. 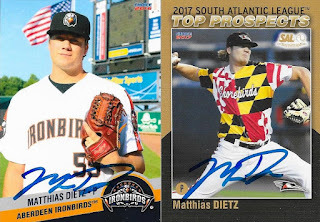 Matthias Dietz was really nice. 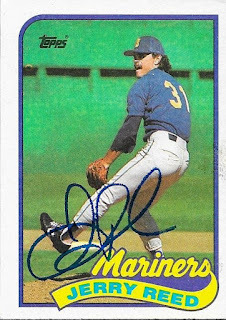 He had a pretty cool mustache going, and we talked about that for a bit while he was signing these cards. I especially like the Maryland Flag jersey on the 2017 South Atlantic League Prospect card. Finally, here are some of the other Ryan Ripkens that I got done.